easy and meaningful Thanksgiving tradition. 1. Print this template* on red cardstock and then cut out head and feet. 2. Print this template on one of each color of the autumn toned cardstock. Cut as many feathers as you think you will need. It doesn’t hurt to print and cut extra and then they will be on hand for next year. 3. Tape the head and feet to the front of the pumpkin. See picture for placement. 4. 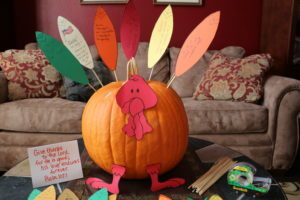 Have everyone write something they are thankful for on a feather (and sign and date on the back side for a keepsake). 5. Tape the back of the feather to the upper portion of the skewer. Make sure the pointy end is facing down. 6. 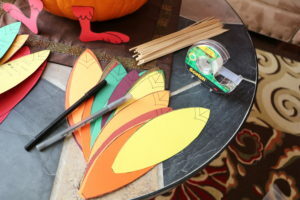 Poke each skewer in the back side of the pumpkin, placing them so it looks like a fan of feathers across the back. If you zig zag the placement forward and back, it will give the turkey more dimension. 7. 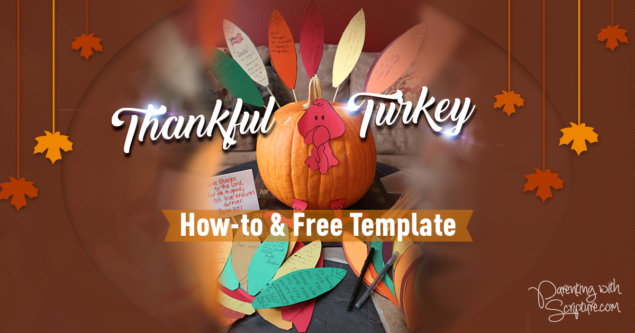 Display the Thankful Turkey where everyone can see it and enjoy thanking God for the things mentioned on the feathers. 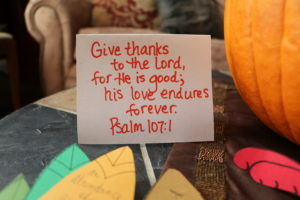 You might want to write this verse to keep beside the turkey. 8. When Thanksgiving is over, keep the feathers, head, feet, and verse and store safely for next year. Each year your pile of feathers will grow. We keep them in a pile on the table next to the current year’s turkey and love looking through them and remembering. Enjoy your Thankful Turkey! Gobble, Gobble! For more ideas and verses on the topic of Thankfulness, see your copy of Parenting with Scripture: A Topical Guide for Teachable Moments.